So You Want to try AYAHUASCA ? I HAD NEVER HEARD OF DRINKING AYAHUASCA UNTIL I TRAVELLED TO THE JUNGLE OF COLOMBIA. It was there that I first caught wind of backpackers discussing ceremonies, shamans, visions, and purging. Some wished to try ayahuasca with a curiosity akin to recreational drug sampling. Others seriously pondered the potential for emotional and spiritual growth. I was captivated — torn between disbelief and a desperate curiosity for the lofty claims made in favor of ayahuasca. We all have things in our lives that we’d like to improve upon and I immediately began obsessing over mine and whether ayahuasca could provide the answer. BUT WAS I REALLY BRAVE ENOUGH — OR OPEN ENOUGH — TO TRY AYAHUASCA? In case you’re as unfamiliar as I was, ayahuasca is a vine found in the Amazon jungle. When combined with chacruna leaves, which contain the hallucinogenic ingredient DMT (dimethyltryptamine), Shamans create a liquid concoction to be used during ceremonies. It’s a sacred medicine for the indigenous people of the Amazon, and they credit the practice with a variety of purposes, from emotional healing to physical repair. My curiosity was quieted in Leticia by a thrilling Amazon tour and the sweltering heat of the jungle. By the time I was heading to the Peruvian side of the Rain Forest, I was ready to escape the bugs and the heat and an ayahausca retreat was far from my mind. But it was there that my curiosity was reignited, for unbeknownst to me, Iquitos is the epicenter of ayahuasca tourism and there’s really no escaping its draw once you land on the shores of this bizarre city. Hostels, cafes, restaurants and street hawkers taunt you incessantly with information and offers for ayahuasca, as soon as you hit the shore of this Amazonian city. Menus offer the ayahuasca diet, which omits salt, sugar, spice, dairy, and meat. Tourists from all over the globe flock here by boat and plane and sample the benefits of the ancient ritual. What followed was one of the most bizarre weeks of my life. My friend and I attended a six-day ayahuasca retreat where we were provided with three ayahuasca ceremonies. Ayahuasca was terrible, wonderful, confusing, and completely different than what I expected. I saw it do incredible things for some people, and absolutely nothing for others. In the end, I’m still no expert on the matter and I’m still a little lost on how to interpret my own experience. But hey, this isn’t Oprah’s couch so you’re not getting the good stuff. If you’re thinking about trying ayahuasca yourself, here are some important things to consider when making this decision. IF YOU DECIDE ITS RIGHT FOR YOU, THAT’S GREAT, AND IF NOT — NO SHAME THERE. IT’S NOT FOR EVERYONE AND I SUGGEST A DEEP ROOTED CONFIDENCE IN YOUR MOTIVATION BEFORE SUBMITTING YOURSELF TO THE EXPERIENCE. 1. AYAHUASCA IS NOT FUN. It’s commonly and poignantly referred to as “The Purge”, which basically means that ayahuasca makes you puke and poop your brains out. It gets rid of EVERYTHING in there, and spares no shred of comfort in the process. I may have struggled with this part, but believe me — the purge eventually revealed itself in a very drawn out suffering. Whoever might approach this in a “recreational” fashion should definitely find new hobbies. 2. AYAHUASCA CAN BE SCARY. I had never tried a hallucinogenic before participating in ayahuasca cermonies, but from what I had heard from more experimental friends was that hallucinogenic drugs produce bright colors and fun visuals that make you giggle like a little kid. Ayahuasca is a much darker experience. Although it can produce bright colors and happy thoughts, it’s more likely to reveal darkness, as the point of the experience is to face your inner demons and to expel them. I heard some laughter in our hut, but I also heard a lot of suffering. It all proved to be productive suffering, but you have to prepare yourself for the possibility of feeling and seeings things that you’ve previously buried. 3. YOU ARE COMPLETELY ALONE IN THIS EXPERIENCE. You may seek comfort in those that surround you before the candle is blown out and the ceremony begins, but once you drink, you are on your own. You will find yourself in complete darkness, likely unable to make out the faces of those around you. Everyone will drift into their own world, and you will be in yours. Be prepared for this, and if you’re only doing it because your friends are doing it — then don’t. 4. YOU MAY NOT EXPERIENCE MUCH OF ANYTHING. People often enter ayayhuasca cermonies with grandiose ideas of epic hallucinations and spiritual awakenings. No matter how open you may feel, remember that Westerners are typically hard-wired to resist this type of physical and emotional vulnerability. It’s regularly effective for the indigenous people of Peru and Colombia, where the practice originated and where the ayahuasca vine can be found, because its ingrained in their culture. Your experience may be intense, or mild, or practically non-existent. But if your mind is open and you’re willing to try it more than once, you’ll likely get the desired effects eventually. Just don’t go into it with inflated expectations. 5. ONLY YOU CAN TELL IF THIS IS SOMETHING YOU WANT TO DO. My friend in no way swayed my decision to try ayahuasca. It was a confusing decision, made easier by the idea of someone joining me to the retreat, but we both went with different motivations and our personal experiences leading up to the decision and during the experience were entirely our own. In overhearing some backpackers discuss the idea of trying ayahuasca, I’ve noticed some peer pressure involved. Ayahuasca is by no means recreational or as I said before — fun. And again, its not something you do “with” anyone else. So decide for yourself and yourself alone if this is something you want to try. If anyone else has a say in your decision, your stomach will be very, very angry with you. 6. RESEARCH YOUR SHAMAN. TRUST YOUR SHAMAN. The popularity of ayahuasca has had some seriously negative effects on the industry surrounding the sacred practice. 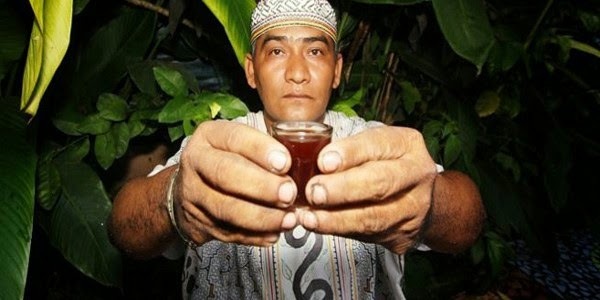 Unfortunately, the surge in ayahuasca tourism has led to scores of fake shamans, just looking to make a buck. Do your research before you put your well-being in the hands of a shaman. They the show during the ayahuasca ceremony and when you’re allowing yourself to become vulnerable under the effects of ayahuasca, you absolutely must trust the person in control. Do you research, talk to plenty of people, and seek the highest recommendations. A large portion of tourists in Iquitos are there to do ayahuasca and everyone is talking about it, so it isn’t difficult to find people who have already participated in ceremonies and seek their advice. Consider this experience similar to going into surgery. You wouldn’t trust just anyone with a scalpel and you should NOT trust just anyone to administer ayahuasca. It might not sound like it with all this talk of blockage and purging and struggle, but I’m glad I tried ayahuasca. It’s a deeply personal experience and it’s different for everyone, but I was able to take away some valuable insight at the conclusion of my retreat. If you choose to try ayahuasca, I wish you all the best in your journey. If you choose to forgo the experience, I encourage you to eat as much spice and sweets and meat as your heart desires and enjoy the natural beauty of the Amazon region — a magical place that can be a cleansing and healing experience in and of itself.